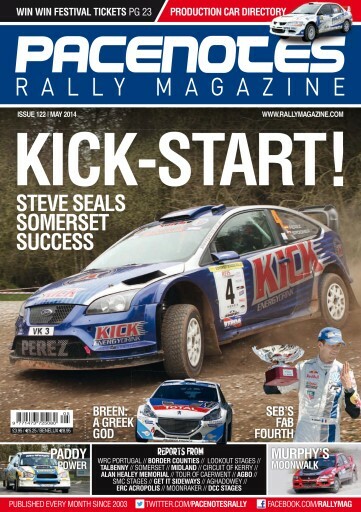 May Issue 122- Out Now! Reports featured this month include, WRC Rally Portugal, BTRDA Somerset Stages, SRC Border Counties, Circuit of Kerry, Moonraker Forestry, Midland Stages plus ERC Acropolis where Craig Breen scored a fantastic victory. The all important clubman rallies from SMC Stages, Get it Sideways, Alan Healey Memorial, Caerwent and AGBO Stages. Our regular RETRO WRC feature from Martin Holmes, takes a look back at Rally Argentina over the years, also don't forget his exclusive roundup from each WRC round throughout the year… it makes great reading! COMPETITION TIME: Also inside are details of how you can Win tickets to the Festival of Motorsport, Kilkenny.